Poor attendance affects students at every age, from kindergarten through high school, potentially causing them to remain behind academically for their entire school career. Chronic absenteeism is defined as a student who misses 18 days of school in a single school year, including both excused and unexcused absences. 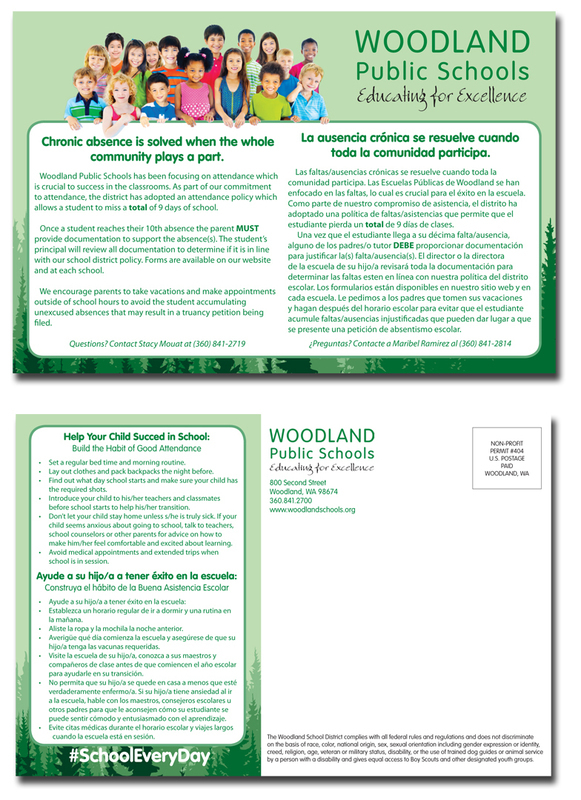 "Missing only 10% of school days, just two days every couple of weeks for a total of 18 throughout the year, makes it harder for younger students, in particular, to learn basic skills like mathematics and reading," said Stacy Mouat, Truancy Specialist for Woodland Public Schools. "By sixth grade, absenteeism is a leading sign that a student may drop out of high school." According to Attendance Works, a nonprofit organization dedicated to advancing student success and reduce equity gaps caused by chronic absenteeism, more than seven million students through the United States are missing so many days of school that they become academically at-risk. Poor attendance can cause emotional and health issues for students, too. "Students who are chronically absent tend to struggle with self-esteem issues as well as depression," said Mouat. "Delinquent students tend to engage in unlawful activities that lead to very negative long-term life consequences." Conversely, Mouat explains that students with good attendance learn valuable life skills helping them succeed in life, "By starting young, students learn how to establish routines, set goals, and develop a strong work ethic by attending school regularly." The significant impacts of chronic absenteeism led the Federal Government to require school districts and states to collect chronic absence data and report it publicly as part of the Every Student Succeeds Act (ESSA). In addition, the Washington State Legislature uses chronic absenteeism as a measure for school accountability. Level 1: Between 1-9 missed school days throughout a school year. Any absences of nine (9) days or less will be excused as long as a parent or guardian contacts their student’s school within three (3) days of the student returning to school and the absence follows the district’s policy for what is considered an excused absence. Level 2: Between 10-17 missed school days throughout a school year. Once a student has missed nine (9) days of school, parents and guardians are notified in writing that they are required to provide written documentation within three (3) days of the student returning to school for all future absences. If the parent or guardian contacts their student’s school regarding an absence within three (3) days, a notation will be entered into the Skyward system, however the absence will remain unexcused until written documentation is received by the school from the parent or guardian. A written note detailing the reason the student missed school, dated and signed by the parent or guardian. A prearranged absence form submitted to the school before the absence takes place. A dated note from the student’s medical professional (doctor, dentist, optometrist, etc.) or other professional service organization explaining the reason for the absence. The validity of all written documentation will be determined by the school’s Principal or designee. Level 2 absences are not guaranteed to be excused. Level 3: More than 18 missed school days throughout a school year. All absences more than 18 school days will be considered unexcused unless specific documentation demonstrates the student has a serious, ongoing medical condition preventing the student from attending school and that they are under direct supervision of a health care professional. In these extreme cases, school personnel will work with the family to ensure appropriate educational accommodations are made for the student. 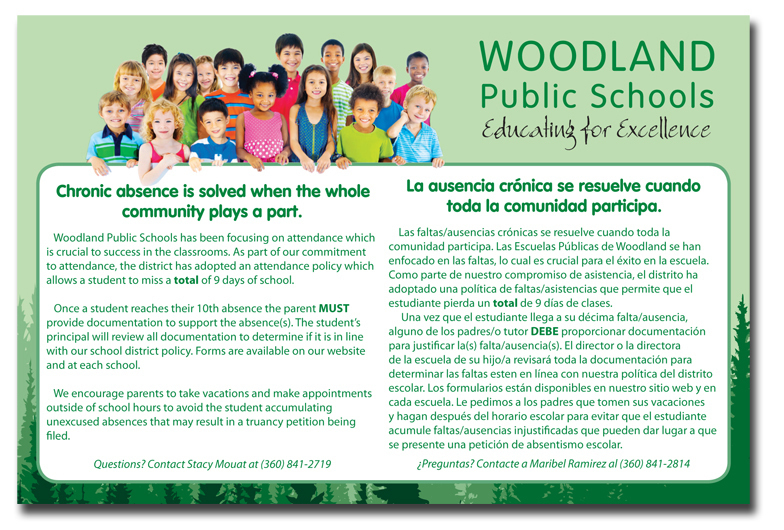 More information about excused and unexcused absences can be found in Woodland Public Schools’ Policy No. 3122 online here: https://goo.gl/74DKVG. You can also learn more about Attendance Works and the importance good attendance plays in student learning and development from their website: www.attendanceworks.org.